GCC region is emerging as the key growing region in global power rental market. 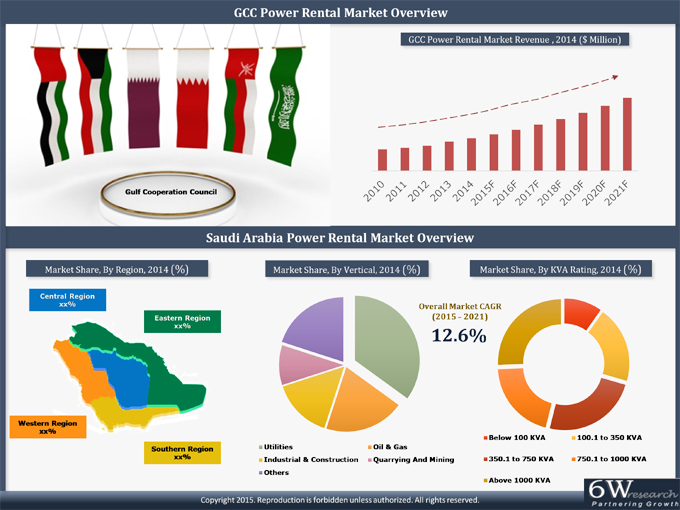 Infrastructure expansion, host region of various international events such as FIFA Worldcup 2022, and World Expo 2020, establishment of manufacturing industries, increasing construction activities, and rising power demand have led for the growth of power rental market in GCC region. In GCC region, countries such as Saudi Arabia, UAE and Qatar are the key revenue generating countries. Saudi Arabia accounted for major share of pie in overall GCC power rental market. According to 6Wresearch, Saudi Arabia power rental market is projected to grow at a CAGR of 12.6% during 2015-21. Changing government policies, establishment of IT/ITeS sector and automotive manufacturing expansion, and growth in public infrastructure are fueling the market for power rental business in the country. Amongst all applications, utilities, oil & gas and construction and industrial applications dominated the market, where major growth is exhibited in construction and industrial application during the forecast period. Also, being the fifth largest nation in global natural gas reserve, penetration of gas gensets on rent is expected to increase in the coming years. The report thoroughly covers the market by genset types, KVA rating types, applications and regions. The report provides the unbiased and detailed analysis of the on-going trends, opportunities/high growth areas, market drivers which would help the stakeholders to device and align their market strategies according to the current and future market dynamics. • Historical data of GCC Power Rental Market for the Period 2010-2014. •	Market Size & Forecast of GCC Power Rental Market for the Period until 2021. •	Historical data of Saudi Arabia Power Rental Market for the Period 2010-2014. •	Market Size & Forecast of Saudi Arabia Power Rental Market until 2021. •	Market Size & Forecast of Saudi Arabia Power Rental Market by Genset Types until 2021. •	Market Size & Forecast of Saudi Arabia Power Rental Market by KVA ratings until 2021. •	Market Size & Forecast of Saudi Arabia Power Rental Market by Applications until 2021. •	Market Size & Forecast of Saudi Arabia Power Rental Market by Regions until 2021. 13.2	Aggreko Middle East Ltd.
13.4	Cummins Olayan Energy, Ltd.
13.6	Energy Equipment Rental Co.
13.9	Rental Solutions & Services Saudi Ltd.
13.10	Nour Energy Co. Ltd.
Saudi Arabia is the fastest growing power rental market in GCC on account of growing demand for power in both on-grid and off-grid areas, increasing industrial and construction activity and expansion of public infrastructure. Utilities, oil & gas and industrial & construction sector are the major demand drivers for power rental market in Saudi Arabia. Diesel generators dominate the power rental market in Saudi Arabia and would continue to dominate the market due to easy availability of diesel fuel and ease of installation. Gas generators accounts for miniscule share in Saudi Arabia power rental market. However, demand for gas gensets are gradually increasing on account of increasing availability of cheaper gas and rising pipeline infrastructure. Higher power rating generators accounts for major share in Saudi Arabia power rental market due to high demand from utilities, oil &gas and heavy industries.